For Dr. Robert Gilman, MD, DMD, and Clinical Lecturer in Plastic Surgery at the University of Michigan (U of M), medical mission work is bigger and more important than simply volunteering his surgical skills. Because he is a surgeon who has participated in Enova’s Mission Program for the last six years, Shedding Light caught up with Dr. Gilman to learn more about his mission experiences and philosophy. Shedding Light: When did you go on your first medical mission trip? Dr. Robert Gilman: My first medical mission trip was in 1998. It was an absolutely life-altering experience for me. I’d been interested in mission work for some time so, when a friend asked if I’d join him as another surgeon for a trip to Cartagena, Colombia, I jumped at the opportunity. Shedding Light: What made that first trip life-altering? Shedding Light: How long have you been going on medical mission trips? Dr. Robert Gilman: I‘ve been leading mission trips to the same hospital in Cartagena for 15 years. Over the years, our volunteer teams have operated on more than 750 children who come from the poorest segment of Colombia and have limited access to health care. Many of these children would have lived in seclusion and shame without the surgery. It’s not that Colombia is without qualified surgeons; the health care structure in the country does not support access to patients in rural areas with few economic resources. Shedding Light: Why do you return to the same hospital and place every year? Dr. Gilman: It allows us to follow up with our patients and grow a working relationship with the domestic providers. Continuity of care and respectful relationship building are cornerstones to successful medical mission trips. Shedding Light: How long is a mission trip and what is a typical day like while you’re gone? Dr. Robert Gilman: Our team is usually in Cartagena for 11 to 12 days; each day begins at 7 am and ends at 7 pm. During the first days there we screen up to 200 patients and then perform surgery on 50 to 70 of them. The children we see tend to have cleft lip and palette but we’ve also seen children needing reconstruction due to burns, genital anomalies, and genetic deformities to the hands and face. We’re hosted by the local Rotary Club International, who puts us up at a modest hotel and provides breakfast and dinner to us. In addition to the surgical procedures we perform, we offer education to local plastic surgeons, general surgeons, resident surgeons and medical students and donate money and supplies to the hospital to help improve conditions there. Shedding Light: What condition is the hospital in Cartagena and how do the Enova LED headlights perform for you? Dr. Robert Gilman: We’ve been fortunate to partner with the Hospital Infantil Napoleon Franco Pareja (Casa des Nino). The hospital is a third world hospital with two surgical tables in one room. They’ve recently done some renovation work and updated equipment. The overhead lights are not sufficient for the oral operations we perform and headlights are the only way to go. 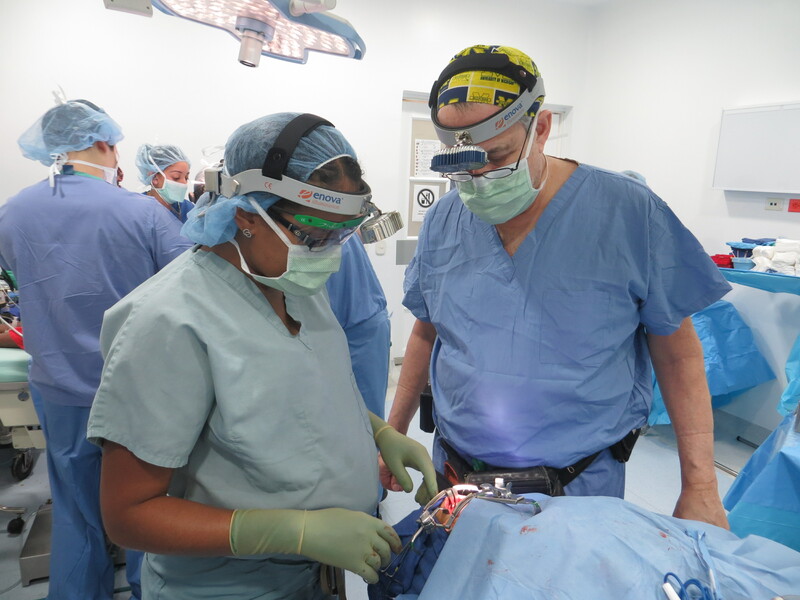 We appreciate Enova Illumination’s Mission Program and have used the Iris D-200 LED Surgical Headlights for the last six years. They are ideal for cleft palette repairs because we can easily move around a patient and the illuminated light is very bright. They’re also lightweight, comfortable and dependable. While we used one battery, we charged a spare and replace the battery at least once a day. Shedding Light: How do medical mission trips impact the doctors who volunteer? Dr. Gilman: Experiences I’ve had doing mission work affect many parts of my life. It has broadened my perspective. I’m more aware of things that we otherwise take for granted. Operating with fewer resources in Colombia has made me a more flexible and capable surgeon. And, over the years I’ve taken 29 residents, as well as other medical professionals, on these mission trips. The long-term relationships built with these people are very important to me and have helped guide my path in unforeseen ways. It is my goal to have each of the residents who come to Cartagena to find the experience so rewarding that they integrate mission work into their own careers. Shedding Light: You’ve always taken U of M medical residents on your mission trips. Why? Dr. Gilman: I completed my residency at the U of M and went on to work in private practice and to train residents at Harvard University. But, I’ve remained connected with the plastic surgery section for most of the time since my residency. I believe it is important to support residents who want to go on mission trips and to do so in an organized way—I’ve been able to bring 14 Michigan residents with me over the last 15 years. I’d like to see us integrate mission work into training and have established a fund* to provide financial assistance to plastic surgery residents interested in international medical mission work. If every plastic surgeon had the opportunity to share their skills with those in need at home or abroad, the world would simply be a better place. *The Robert H. Gilman Fund for International Travel is available through the University of Michigan. Donations may also be made to through Healing The Children, Northeast Inc.
April has been a busy month for trade shows! 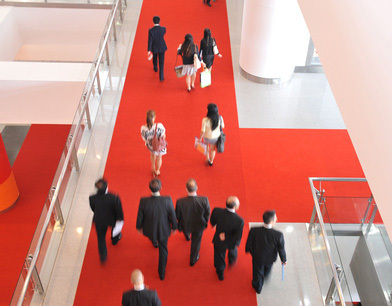 Enova Illumination has been, or is currently, exhibiting its LED surgical headlights at the following conferences. If you’ll be in attendance at any of those shows currently in session, please stop by our booth.